Lechuguilla Cave is, as of 2006, the fifth longest cave (120 miles (193 km)) known to exist in the world, and the deepest in the continental United States (489 metres (1,604 ft)), but it is most famous for its unusual geology, rare formations, and pristine condition. It is located in Carlsbad Caverns National Park, New Mexico. Access to the cave is limited to approved scientific researchers, survey and exploration teams, and National Park Service management-related trips. Lechuguilla Cave was known until 1986 as a small, fairly insignificant historic site in the park's backcountry. Small amounts of bat guano were mined from the entrance passages for a year under a mining claim filed in 1914. The historic cave contained a 90 feet (27 m) entrance pit known as Misery Hole, which led to 400 feet (122 m) of dry dead-end passages. The cave was visited infrequently after mining activities ceased. However, in the 1950s cavers heard wind roaring up from the rubble-choked floor of the cave. Although there was no obvious route, different people concluded that cave passages lay below the rubble. A group of Colorado cavers gained permission from the National Park Service and began digging in 1984. The breakthrough, into large walking passages, occurred on May 26, 1986. Since 1986, explorers have mapped 118 miles (190 km) of passages and have pushed the depth of the cave to 1,604 feet (489 m), ranking Lechuguilla as the 5th longest cave in the world (4th longest in the United States) and the deepest limestone cave in the country. Cavers, drawn by the caves' pristine condition and rare beauty, come from around the world to explore and map its passages and geology. A story of questionable authenticity surfaced in April 1997 about Lechuguilla cavers breaking through into Carlsbad Caverns. It appeared in the "April Fool's 1997" edition of the Maverick Bull, a newsletter of a local chapter of the National Speleological Society. The story entailed the Lechuguilla cavers discovering a large "borehole" passage which led to a passage in the ceiling of the Mystery Room in Carlsbad Caverns. This article was definitely a joke. Lechuguilla Cave offered even more than just its extreme size. Cavers were greeted by large amounts of gypsum and lemon-yellow sulfur deposits. 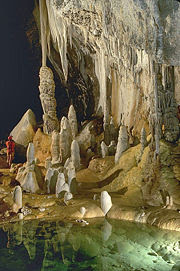 A large variety of rare speleothems, some of which had never been seen anywhere in the world, included 20 feet (6.1 m) gypsum chandeliers, 20 feet (6.1 m) gypsum hairs and beards, 15 feet (4.6 m) soda straws, hydromagnesite balloons, cave pearls, subaqueous helictites, rusticles, U-loops and J-loops. 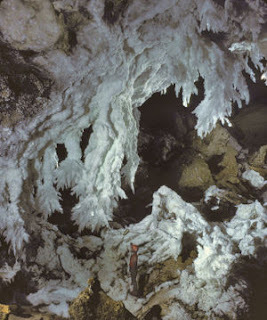 Lechuguilla Cave surpassed its nearby sister, Carlsbad Caverns, in size, depth, and variety of speleothems, though no room has been discovered yet in Lechuguilla Cave which is larger than Carlsbad's Big Room. Scientific exploration has been conducted as well. For the first time a Guadalupe Mountains cave extends deep enough that scientists may study five separate geologic formations from the inside. The profusion of gypsum and sulfur lends support to speleogenesis by sulfuric acid dissolution. The sulfuric acid is believed to be derived from hydrogen sulfide released from oil reservoirs below. Thus, this cavern (as well as Carlsbad Caverns) apparently formed from the bottom up, in contrast to the normal top-down carbonic acid dissolution mechanism of cave formation. Rare, chemolithoautotrophic bacteria are believed to occur in the cave. These bacteria feed on the sulfur, iron, and manganese minerals and may assist in enlarging the cave and determining the shapes of some unusual speleothems. Other studies indicate that some microbes may have medicinal qualities that are beneficial to humans. Lechuguilla Cave lies beneath a park wilderness area. However, it appears that the cave's passages may extend out of the park into adjacent Bureau of Land Management (BLM) land. A major threat to the cave is proposed gas and oil drilling on BLM land. Any leakage of gas or fluids into the cave's passages could kill cave life or cause explosions.